NCLT Recruitment 2019: National Company Law Tribunal invites offline application from qualified aspirants. Currently it has many numbers of openings at various locations. Recently it has released the recruitment advertisement for Dy. Registrar, Assistant Registrar, Court Officer, Private Secretary & Stenographer posts. Applicants who are seeking central govt jobs in Karnataka, Tamilnadu and Maharashtra can use this chance. Eligible candidates should send the filled application form to given address. The last date for receipt of the application is 15.04.2019. NCLT recruitment application form and notification is available in official website. Applicants must have possessed Degree in Law/ Graduate from recognized university. Selection will be based on skill test/ interview. Selected aspirants will be placed at Delhi, Ahmedabad, Allahabad, Bengaluru, Chandigarh, Chennai, Cuttack, Guwahati, Hyderabad, Jaipur, Kochi, Kolkata and Mumbai. Application received after the due date or incomplete application will be rejected. More details of NCLT recruitment vacancy, upcoming notices, merit list, selection list, admit card, result, upcoming notifications and etc. will be uploaded on official website. As per the notification, there are many numbers of vacancies are allotted for this recruitment. Post wise details are given below. Applicants must have possessed Degree in Law/ Graduate from recognized university. For Registrar & Court Officer posts, applicants should be a retired officer. Candidates age limit should be 62 years (for Registrar, Asst. 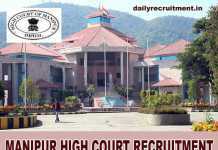 Registrar & Court Officer posts). Go to official website nclt.gov.in.